The Bottle Bong is a handy product for any party. 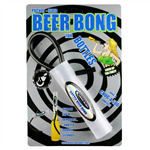 It attaches to any standard glass bottle, and allows the drinker to down their drink quicker than without the bottle bong. This product is made with food safety plastics, resulting in this product being food safe standard. It is perfect for retail purposes, as it comes attached to a design piece of cardboard, allowing it to be easily displayed. An ideal drinking accessory for any party site, gadget site or stag and hen parties.